This expansion of Descent: Journeys in the Dark takes the game and makes it into a campaign (with Avatars, Lieutenants, Plots, more Treasures, more Traps, Feats, more Skills, and more more more). This is a great game. My friends and I have created expansions to this game as well… we created new monsters, new skills, new maps, new feats, new avatars, new lieutenants, new abilities, new dungeons, new dungeon locations, new everything. 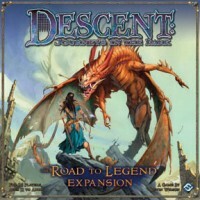 Add a Review for "Descent: The Road to Legend"